Practice journalism where you read journalism—online. LaunchPad Solo for Journalism helps students to master their writing skills and prepares them for today’s media landscape. This online tools hosts a variety of digital resources including Exercise Central for AP Style, a quiz bank that allows students to master the nuances of journalistic writing; a library of videos from professional journalists talking about contemporary topics such as convergence and media entrepreneurship; and the Exercise Books for Working With Words and News Reporting & Writing. Additionally, each purchase of LaunchPad Solo for Journalism comes with access to Macmillan Learning’s Video Tools, which allow students to upload videos they create or videos they find on the Web, so they can be viewed and critiqued by their instructor and/or classmates. 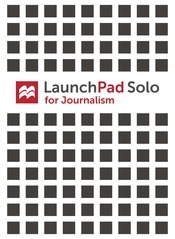 LaunchPad Solo for Journalism can be packaged easily with News Reporting & Writing, Telling the Story, and Working With Words.